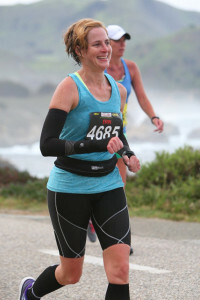 The 29th Annual Big Sur International Marathon was my first 26.2–what a fantastic experience. It took a lot for me to get here, and Big Sur was a race that I’ve been wanting to do since grad school–well before I was ever an actual runner. It’s a notoriously difficult course, but I figured that if I only had one marathon in me, I wanted it to be this one. I also figured that the first one would be really hard no matter what, and I’ve always been a “go-hard or go home” type. I registered on July 10th as part of the Runner’s World Challenge. It cost more (like $200 more), but in return, I could register a week early (in retrospect a very good thing since the full marathon sold out in under two-hours once regular registration opened). In addition, participants had a dedicated Bib pick-up at the Expo, special events like a shake-out run Saturday morning with the editors & writers for the magazine, a dedicated bus to the start that left at 4:15 rather than the earlier 3:30 for everyone else (plus they were chartered buses instead of school buses), a dedicated & heated pre-race tent with coffee/tea, Gatorade, water, bananas, bagels, and most importantly, private porta-potties–NO LINES!). There was also a post-race tent with a nice spread of food and drink including Jamba Juice! I trained for the race using the Hansons’ Beginner plan, which is a bit unorthodox in that its long run peaks at 16 miles (that’s 10.2 miles less than the full race length). It prescribes 6 days a week of running including one speed/strength day and one tempo day in addition to the long run. The other 3 days are easy pace of varied lengths. I opted for Hansons after reading as many reviews of different plans that I could get my hands on. I liked the idea of spreading mileage out over the course of a week rather than piling it on on the long-run day, and their philosophy of cumulative fatigue made a lot of sense to me. Things were going great until the first week of March when I sprained my ankle (either rolling it out in the woods or falling down my back stairs, or both). That meant that on March 18, I got a cortisone shot, which hurt like a son-of-a-gun, but it worked. All in all, I logged 800 miles in training (an even 800, which is weird, but whatever) over almost 4 months. Be aware of the cantered roads and aim for flatness when you can to save your ankles (notably, my ankles are possible the only part of my legs that weren’t sore after the race). Be aware of the relay exchanges over the course of the race and don’t freak out when a runner goes flying by you at mile 17–they’re most likely running the relay so are running 5 miles instead of 26.2. He was very nice, and I wish I knew his last name so I could thank him for the tips (again)–so if you’re out there Chris from San Fran, thank you! Our flight got in early, but I lost those 20 minutes plus another hour waiting in line at the Hertz counter. I ended up with a good car–a Mazda 3, which I liked because it’s just like my Subie, so I knew where pretty much everything was–came in handy immediately since it was raining that day. I had hoped to get to the expo & hotel by 3:00, but that didn’t happen thanks to the line. Finally made it there just before 5:00 (the expo was only open until 6), so I parked and went in to get my bib before checking in to the hotel. Check-in was painless & the expo was empty. I had planned to go on a pizza adventure for dinner, but as soon as I left the hotel, it started raining again, so the 20 minute walk without a raincoat or umbrella seemed a bad idea, at least it seemed a bad idea to my iPhone & Kindle . . . so I had dinner at the hotel bar, which was very crowded, but fine. I went to bed at like 8:00 (pacific time, & I had been up since 4:30 est), but I didn’t sleep well. I woke up at midnight feeling like it was morning and had a hard time falling back asleep. I could feel my heart pounding with anticipation for the race. I read a bit and eventually calmed down enough to get a bit more sleep. The next morning was a shakeout run w/ the Runner’s World Challenge. I donned my Oiselle favs (Flyte ls in fresh green & Mac Rogas in indigo) and headed out to the meeting place. I immediately met Tish Hamilton, one of the editors, who complimented me on my top and Meg Hertzel, one of the staff writers–they are both fellow Oiselle fan-girls! Meg and I ran together, and she really made me feel welcome. There was a nice spread afterwards with water or gatorade, bagels, granola bars, etc. I also met some of the other challengers whom I had been chatting with in the forums previously. Erin Ankle–that’s me :). I had already been to the expo, but since it was right there, I figured I would walk around a bit more. What a difference a day makes! The energy in the room was palpable, and there were a LOT more people there. I ended up at the FlipBelt booth where I tried one on. It was really helpful since I was between two sizes. Not only could I try them both, they had all kinds of stuff at the booth to load up the belts–such a great idea since nobody wears it empty on race day! When all was said and done, I had several gels, some ShotBloks, a phone and some other bits and bobs stuck in the belt, and I jumped around the expo like I had ants in my pants. But the belt didn’t budge! I bought one–the hardest decision was the color (I ultimately went with basic black). I went back to my room, showered, and changed. I then went to find Gianni’s pizza for lunch (pizza for lunch the day before has become a race-weekend ritual). I found the restaurant, placed my order, and then went across the street to CVS to buy sunscreen (which I ultimately didn’t use). I ate in my room and then walked down to the plaza when I got a call from Nick, my college President’s brother. He and a group of friends from Spartanburg/Greenville were also running the race, and they had invited me down to Big Sur to hang out with them and have dinner. Before driving back down, I made one more stop at the expo. I had seen a travel-sized foam roller earlier, but I didn’t buy it before. I thought that maybe I would wish I had after the race, so I decided to pick one up. I got in my car and began to make my way down Hwy 1 (the course, but backwards). I immediately started to panic since everything I had read had described the Carmel Highlands as “rolling hills,” but the first hill I came to was anything but rolling. It was steep! And long! But, as I soon learned, it was also not part of the course. Whew! It was a beautiful day, and after my initial fright, none of the hills seemed too bad. Of course, I was in a car and going to other way . . . When I got to Big Sur, I was supposed to call Nick so he could come meet me, but I had a very hard time finding a signal. Eventually, I pulled off in the right place, and thankfully I was going slow when I got back on the road because a deer darted right out in front of the car! Had I been going the speed limit, I would have hit it. Disaster averted, I found the turn and finally met Nick and his friends. They were very welcoming, and I felt at home almost immediately. There were 6 of them participating in the race–5 doing a relay, and Nick was running the marathon. I was the only first-timer in the bunch, so I got a lot of good advice on the course and they all weighed in on my questions about whether to wear sunglasses or a visor (I ended up skipping both since the forecast called for clouds and a passing shower). We had a great dinner of pasta & salmon with pound cake and blueberries for dessert. After a breath-taking sunset (the compound was right on the ocean), I drove back up the coast to get ready for a 3AM wake-up call. Between pre-race jitters, excitement, and being nervous that I would oversleep and miss the shuttle, I barely slept at all on Saturday night. I was up in plenty of time to have a Mojo bar (peanut butter pretzel!) & a cup of tea. I did double-duty with the anti-chafe wipes and then got dressed in my race day outfit (Winona tank, CWX compression shorts, Zoot compression socks, Oiselle arm sleeves, purple LunarEclipse 3s, my FlipBelt, and a throwaway fleece). I was pleasantly surprised to see that we had really nice buses for the hour-long ride down to Big Sur. I had a row to myself and chatted a little with the couple behind me, who were also from Pittsburgh. The bus was dark, but there’s no way I would get any sleep this close to race time. I just tried to relax and breathe. When we got to the start, it was really crowded & there were people everywhere! The lines to the porta-lets were really long, and supposedly there was coffee, but I didn’t see anything but people. The Runner’s World Challenge had its own tent, which was really great. It was heated & there were separate porta-lets for us to us with NO LINES. They also had coffee, tea, bananas & bagels. I was to nervous to eat much, but I did have a bit of raisin bagel. Finally it was time to make our way to the starting area. I went out with other Challengers, but we got separated in the crowd pretty quickly. I lined up between the 3:45 and the 4:00 pace groups and tried to bounce around a little bit to stay warm. There were people darting off into the woods right and left despite warnings from the announcers about poison oak. Soon, someone sang the national anthem, and Deena Kastor wished us a good race. The announcer said that it was as close to perfect course conditions as they’ve seen in years, so people who’ve run before should expect a course PR (no pressure!). The first wave started right at 6:45. I was in the second wave. We waited 3 or 4 minutes, and then we were off. I made my way over the line at 6:49, and I was pretty emotional to start. I couldn’t believe it was finally here! And I couldn’t believe I was going to be running for the next several hours . . . I went out slowly, which wasn’t easy since everyone around me was going faster, and we were all going downhill. I have always been a come-from-behind runner, so I let them go as best I could. It got harder when the 4 hour pace group went flying by before we even got to mile 2. (I had hoped to break 4 hours–my A++ goal was 3:47. My pace chart was for 3:48, but I would be happy as long as I was under 4 hours). I thought I might have to adjust my goals, especially because I had a bit of a side stitch in those early miles, which meant that I couldn’t speed up at all. I let them go. I let lots and lots of people go, including Dean Karnazes. I wasn’t too far behind my pace chart, which I had calculated to have a conservative start, so I wasn’t too worried. Before long, we were out of the woods and the course opened up to views of the Pacific. Hwy 1 is one of my most favorite drives in the world, and it was amazing to be there as a runner. I tried to take in as many of the views as I could, but I didn’t want to stop and take pictures–many, many people were stopping all along the course, and I completely understand why–it was one big photo op from start to finish! But I figure that if I wanted to take pictures, I could drive down again later (ultimately, I didn’t). Initially, runners had both lanes of the road, but by mile 4 or 5, the race narrowed to just the left lane. The right was to be kept open for traffic. I basically ran along the right lane. This turned out to be a good strategy since it was usually pretty easy to pass people, the photographers were mostly on that side, and the road wasn’t too steeply cambered there. The first course photographers were at the bottom of the next hill, and I feel a little bad about darting in front of some random woman who had basically moved right in front of me, but she was going slower than I was, and I wasn’t just going to hang out behind her. There’s now a photo of us with my arm in front of her face. Oops. We never did get the passing shower that was called for, and it was wonderfully overcast almost all morning. I felt good and was keeping a very steady pace (though I didn’t know it at the time–I only checked later) through mile 16, when it occurred to me that I was entering “Never run this far before” territory. It felt strange and pretty awesome. I was still a couple minutes off the pace card, which I had tucked in my arm sleeve. I was fine with this, however, because it meant that I was still well ahead of the 4 hour time. I felt good at that point, and I decided that I would put the card away and just run the last ten miles as best I could without worrying about what the card said. I came upon two of the relay-runners from the day before between mile 21 and 22. Gordon and John had apparently decided to run the rest of the course as a training run. I said hi to them as I went by (I didn’t have much energy to say more than just “Hi”), but Gordon sped up to my pace (it didn’t require much) and asked how I was doing. I was starting to get pretty tired at that point. He ran the next hill with me and then told me to keep going, that he was going to drop back and ask John something, but that he’d catch back up. So I was on my own again for a little while, and then he was back, and he coached me through the rest of the race. We finally got to the famous strawberry station at mile 23, and I grabbed a few. They were really good, but I’m pretty sure I would have felt that way about cardboard at that point. These were definitely better than cardboard. Gordon stayed just ahead of me, and that was both great because it forced me to work to stay with him and possibly very annoying for other people on the course since we were all trying not to pass out, and he was Mr. Energy! He kept telling me that I had just a little farther to go and compared it to the Rail Trail where I run all the time. At one point, I asked him “Are we at the Dog Park yet?” (The dog park is about half way). He looked at me like I was delirious until I explained that I was comparing it to the rail trail. Finally, we saw the finish line area, and that gave me a boost. I felt like I finished strong, and it was very cool to hear my name over the PA system–and the announcer told everyone that this was my first marathon. I crossed the line, remembered to stop my watch, and got my finisher’s medal. I got my picture taken and got separated from Gordon. I found the sneaky Runner’s World exit and then wandered around that area for a few minutes trying to find my bag (I had walked right past it twice!). When I finally got my bag, my first priority was the Wet Wipes, which were awesome. Then I wanted to find a place to change since both my bra and my tank were soaking wet. I was directed to the port-lets outside in the Finshers Village, and that’s when I wandered into Nick, who took me to the VIP area. The VIPs had fancy porta-lets with running water & flushing toilets. I changed and met up with the rest of the group, all of whom were very happy for me. I had run a 3:52, which wasn’t the A++ goal, but I was thrilled. I sat down, and Nick said that we had to text his sister (my college President) and tell her how I did. I didn’t have her number, so I basically unlocked my phone and gave it to him. He wrote the text & we sent it on. I also texted my parents & George & my Spartanburg running friends Cate & Ben & Ned. I was pretty out of it, but it felt really good to have finished. Eventually, I got on the school bus to go back to the hotel, where I showered and bonded with the new foam roller, which I was grateful to have. I then got back in the car and went back to Big Sur for dinner. Driving back down Hwy 1 was an amazing experience. By now, the sun was shining, and I couldn’t believe I had run that whole way just a few hours earlier. It was a lovely afternoon, and we capped it off with dinner at Nepenthe, where I had the best cheeseburger possibly ever. I drove back up to Monterey as the sun set, and I stopped a few times to take pictures of the view. I also stopped at the grocery store, where I wandered around in a daze before making my way back to the hotel. It was a different place with so many of the racers gone already. Much quieter. I woke up the next morning and, since both of the doctors I had talked to the day before had suggested it, I went for a run. It was more of a shuffle, but I had my iPod, and the bike path along the Monterey Bay was beautiful. After the first mile, it was okay. I stopped at Starbucks before heading back to the room to check out. I spent the next few hours in the hotel lobby. I called my parents, and caught up on email. I also registered for another marathon: Paris in April 2015.